The Meccanica Taraschi is an Italian automobile manufacturer, founder of the brands Urania, Giaur and Taraschi and active from 1947 to 1961. Established in Teramo by Berardo Taraschi, at the end of the Second World War, the Meccanica Taraschi start building small competition cars. ​From 1947 to 1948, Taraschi made ​​a small series of seven cars with the Urania label, intended for competition "Sport" in class 750 cc and competitions F2 and F3 . The vehicles were built on mechanical Fiat 500 "Topolino", with motor BMW motorcycle-derived boxer, mounted in the front or rear position. The excellent qualities of stability and lightness were, however, strongly penalized by low engine power and the end of 1949 was an agreement with the company Roman Giannini , specialized in the development of sports engines, constituting Giaur brand stands for Giannini Urania . With this brand were built 48 racing cars of various types, from cars to coaches, equipped with the G1 and G2 engines, the latter designed by Ing. Carlo Giannini. After the collaboration with Giannini, in 1958 , production resumed under the Tarascans brand and remained active until 1961. 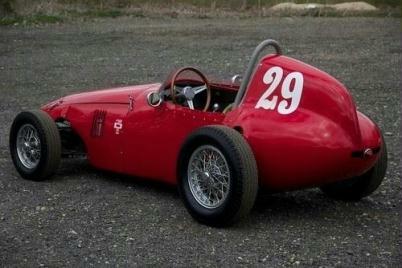 In those years were built 63 single-seaters for Formula Junior , equipped with engine Fiat 1100 , mounted on a tubular frame. ​After the interruption due to World War (during which it is aggregated to the Pasubio Division as a biker scout, taking part in the Russian campaign), in July 1944 he returned to Teramo recovering the mechanical workshop activities. In ' August 1945 also incorporates the racing activities, taking second place in the circuit Tortoreto (Teramo), considered the first motorcycle race in Europe after the war. 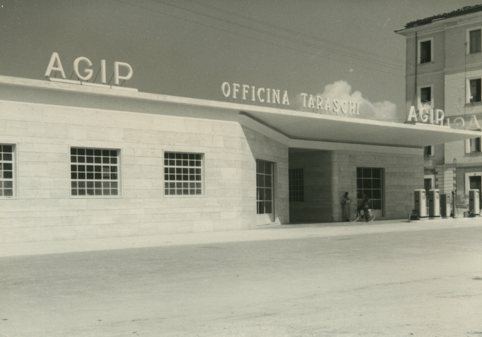 The mechanical workshop of Taraschi become a real car company specialized in the production of racing cars, which will be operational until 1960 ( Mechanics Taraschi ). In 1947 he built the first two-seater sports 750, a model that was baptized with the name of Urania (the name was suggested by the Marquis de Diego Sterlich Aliprandi and is inspired by the Urania hill is located near Teramo). The model was a great success, and soon became the car to beat in the races. ​Taraschi build it starting from the basic mechanics of the Fiat 500 Topolino, recovering chassis, suspension, transmission, steering and brakes, while the engine opts for BMW R75, cheap and easy to find, that he personally processes to strengthen it. The frame is also of Mickey Mouse, which is elongated in the rear area and reinforced in the central part; the body processing is performed by a specialist, the Milanese Venancio Pozzi, which Tarascans alongside a local craftsman, Giovanni Foschini, who will be able to prepare for the successive Urania. The model debuted in Piacenza on 11 April 1947 , in the Circuit de Piacenza , where Taraschi took third place, achieving the fastest lap. While in front of the excellent results achieved by the Urania from the earliest appearances, the model suffered showy limits imposed by the original chassis Mickey; these limitations made ​​it necessary to resort to a specific tubular chassis structure, the implementation of which Tarascans worked from the end of 1948 to complete the following spring. After the first stage of automotive development of the post-war period, which was affected in the country clear of all issues related to the emergencies of the immediate post-war period, subsequent evolutions imposed by competition were such as to lead to the birth of Urania of the second generation, which are also modified to adapt to the new regulations of the Sports category, in particular the class 750. The new model is set to a lightweight tubular frame in drawn steel cromomolibdeno , whose implementation is entrusted to Francesco Cappelli. A revised suspension and motopropulsivo group is moved forward, resulting in criticality relative to the center of gravity, which, however, is overcome thanks to the suitable position that is given to the pilot. These are innovations that bring Urania to achieve the successes of 1949, which have a significant effect even in commercial terms, since at Tarascans are commissioned several models. The Teramo pilot proves to have reached constructive maturity and credibility, to the point that large producers of the components offer their supplies. For its sports advertising also reaches agreements that allow you to sort the most of its cars (for the tires Pirelli, Shell for fuel). 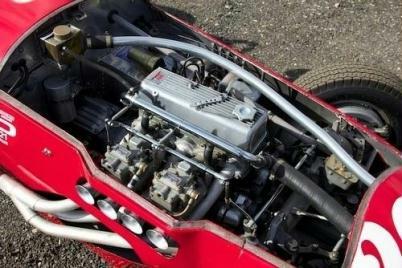 Faced with the success achieved by the Urania, Tarascans decided to try their hand at Formula 2 using a 500 displacement engine with supercharger (alternative solution to the naturally aspirated engine 2000). Overfeeding had attracted Taraschi Paris since the Benelli, in 1939 , assisting in the Pesaro factory to work on motorcycle engines. thanks to which it can recover the Roots compressor for Taraschi compressor can count on the friendship of the Giannini brothers. The new technical solutions have major repercussions on the car, which then impose a number of subsequent interventions in the races to ensure the optimal performance of the supercharged model, which is brought to light in May 1948 in Bari Grand Prix, winning the 500 class and coming eighth in the overall standings. The adventure in Formula 2, also meant to be exploited commercially, however, is quickly abandoned in front of the penalizing comparison with naturally aspirated engines. The 1949 is the year in which the Urania 750 gets the best results, winning several first places: in the 9th Tour of Sicily (March 20), in the Circuit Reggio Emilia (May 7), in the 1st Circuit of the Castle Teramo (May 22), in the 2nd Grand Prix of Naples (June 19), in the 3rd Cup of the Dolomites (July 17), the circuit Pescara (12 August) and in the time trial of Caltanissetta (September). Faced with the successes and flattering Taraschi awards expresses initiative and creativity of the structural design, pushing towards the rear engine solution, with the aim of improving the weight distribution in the car, and conceiving, even with limited means, a vehicle for formula 3. This time the results are revealed immediately bad, because from the very first testing out the car, driven by the Tarascans, undergoes a double rollover. The adventure of "pattern behind everything" ends here. The disappointments for the manufacturer Teramo are also of a commercial nature since the sale of its Urania-BMW, ​​cars difficult to drive, requiring an advanced technique that private clients have not suffered a sharp contraction. The most prestigious stage as a builder is registered since 1949 , when it signed an agreement with the famous house of the brothers Attilio and Domenico Giannini, from which was born the Giaur model (name inspired by the horse "Giaur from Brivio" , one of the largest Italian trotters) that united the qualities of the frame of the Teramo home in the motor of the Roman house. The agreement between the Tarascans and Giannini was inspired by journalist John Canestrini , deep knowledge of the reality of the automotive sector, who advanced to them to establish cooperation, which had important repercussions for both sides both on a sporting level and commercially. ​​The production of the models, inspired by the previous Urania tubular frame, takes place in the new complex of the Tarascans, located near the railway station of Teramo. For the realization of each specimen it needed about four months of work. Thanks to the skills of the Tarascans in mechanical engines were received from Giannini personally revised by the manufacturer Teramo, both to eliminate any imperfections present in the assembly, and to contribute to the development of the engines themselves. The models produced in the years of experience Giaur were based on two engines: he departed with single overhead G1 who in 1953 was replaced by the DOHC engine G2 that arose as a result of the rapid technical evolution of the 750 Sport category. Over the years the agreement with the Giannini brothers are made fifty specimens, some exported to the United States, who gained many results (more than 120 victories) and were driven by the best drivers of the fifties. A demonstration of the absolute level of Giannini engines, during the 1952 , when it is already working on the design of the two-shaft G2 that will supplant the G1 (which now suffers from competition from other engines) the victories achieved by the Tarascans are even sixteen. In 1953 , the season the technical content particularly incensed, the Giaur, thanks to the continuous refinement work, we demonstrate the stealers of the season bringing success in the most important circuits and hill climbs. Successes that the DOHC G2 will not be able to replicate, in spite of the sports and business expectations; the same assemblage of engines ends up being cheesy, and the fact Taraschi forces to perform a mount to perfection, while making the necessary improvements. ​The first copy of Giaur is employed in 1949, on the occasion of the Castle circuit , car race that took place in Teramo , while the first victory, the driving Mario Raffaelli , the Giaur if the wins at the 10th Grand Prix of Rome . Already in the first year, 1949 , considered the running, there's four wins and other good placings, while in the year following the wins doubled, with statements of special importance competitions. In 1951 Taraschi gets national consecration as a constructor: the Giaur led by Sesto Leonardi won the Italian championship of Sport Class 750. The same Tarascans, as a pilot, he won the national title in 1954 . In this period the "Team Taraschi" is also organized, stable that has the function of coordinating the sport and that of customers. The fifties saw the construction of several Giaur models designed for the Sports category. In 1953 the two-seater is designed Champion (innovative model for particularly aerodynamic body) that was used for about five years, with many successes including international (in France and the United States). 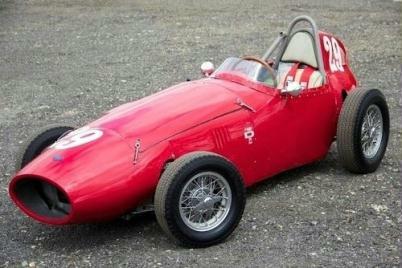 In 1954 it was the turn of the Red Blitz car, with which he won the Tarascans of 750 Racing national title. In his career Taraschi went up to the prestigious category of Formula 1, for which the manufacturer Teramo tried to realize a Giaur seater model, which made ​​its appearance in just four races. Always at the level of Formula 1 Tarascans also tried his hand as a pilot, buying a Ferrari 166, 1951 ; the car itself had characteristics that made it uncompetitive already in Formula 2, so Taraschi set to work in order to incorporate a series of technical and functional changes which significantly increased the competitiveness (increase in engine capacity, engine development, start-up electric, vehicle frame variants). With this model Taraschi participated in 14 grands prix with dignity disputatisi in the country between 1954 and 1957 , among which the fifth place achieved in the Grand Prize of the Valentino in Turin and the sixth place in the Grand Prix of Naples . The agreement with Giannini continued until 1957 , when Taraschi started producing the cars cars for the new category of Formula Junior, for the training of junior staff. The first experimental model, which was abandoned the glorious Giannini engine, takes part in the competition debut of the class, held in April 1958 , where Taraschi finished second on a car that proves to be the fastest of the participants. ​The following year he was instead put into a site designed specifically for the Junior category, for which the Tarascans is inspired, like many Italian manufacturers, the basic mechanics of the Fiat 1100/103. The evolution of this model lasted until 1961 with growing problems both economic (for the high operating costs) that technical, as a result of exasperated evolution that undergoes the category, especially with the transition to the international dimension. There are however in recent years the wins and good placings in the Junior category, even in the United States , where they were exported to as many as 13 models of Taraschi Junior. Since 1959 and particularly during the 1960 English cars of Cooper gradually take over, but nevertheless not too lacking in this crucial moment of placings and victories transition. The comparison with the highly advanced English achievements, the expression of a professional reality and much more advanced engineering, becomes prohibitive for Italian manufacturers, with the consequent decline of results in competitions. ​The Tarascans himself was able to see directly the stunning superiority of Cooper, making directly a test on a specimen of a customer. In 1961 Taraschi definitively winding up its automotive activities and is exclusively dedicated to the commercialization of automobiles (since 1958 was dealer Volkswagen ).